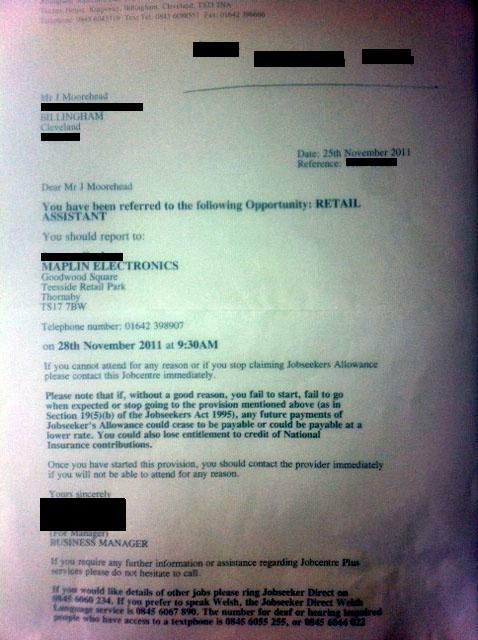 The above image shows a job advertised by Job Centre Plus. (Website link) It involves unspecified night shift work (probably shelf stacking) and the wage is Job Seeker’s Allowance plus expenses. Tesco will pay no wage for this work. It also says that the job is permanent but I think this must be a mistake. 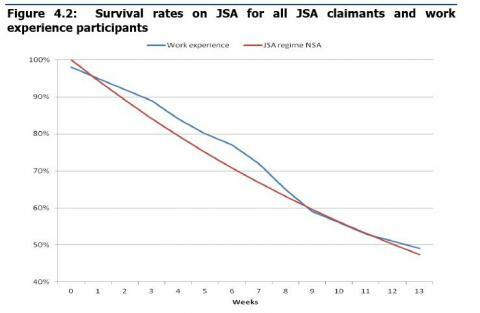 SBWA is supposed to guarantee a job interview at the end of the unpaid placement, but so far only about a fifth of people taking part in these schemes have been given a permanent job at the end of it. 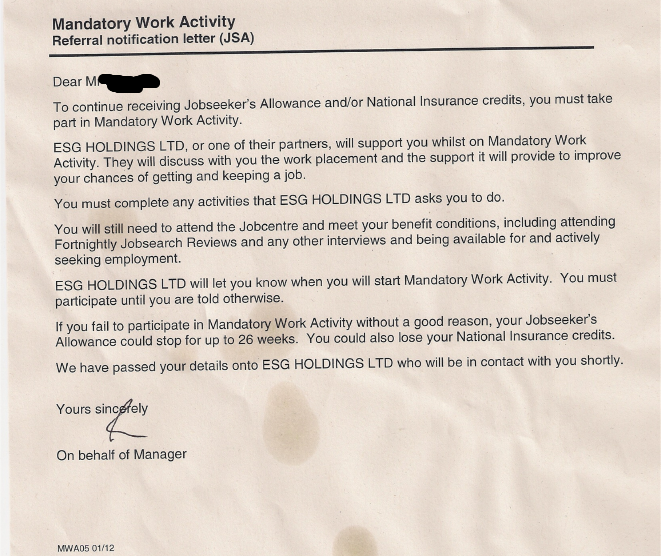 The Conservatives are very proud of their efforts to get people back into work, especially their Work Programme. Most of their efforts seem focussed on getting job seekers into unpaid work placements in shops and supermarkets and there are multiple schemes to this end. 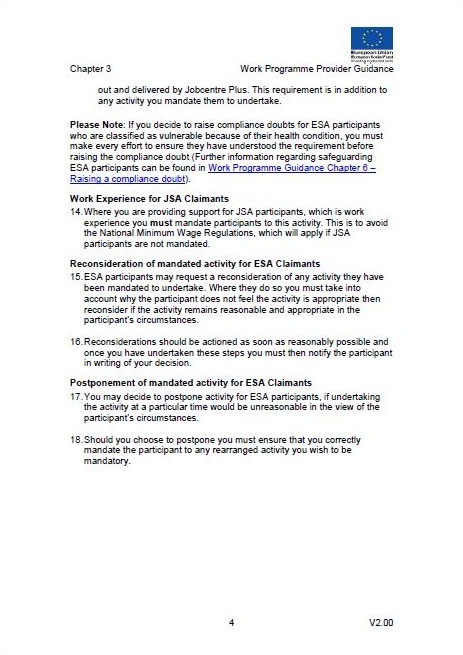 Many of these people are given no choice in the matter; placements are often chosen for them, and they can lose Job Seeker’s Allowance for 13 weeks to 6 months if they will not go. Some of these placements can last as long as six months. No wages are involved – Job Seeker’s Allowance is paid, and sometimes bus fares. Unpaid placements are not only bad for the unfortunate people who are forced to do them but they also deprive people of proper paid work. Tesco has been one of the largest users of work placement schemes taking on several thousand unpaid workers over the last year. The work that they do is the same as the paid staff. Now Tesco are taking unpaid workers for the night shift too, which is a new development. These people are not only working for no pay apart from minimal benefits, now they are being put through the ordeal of working nights without compensation. 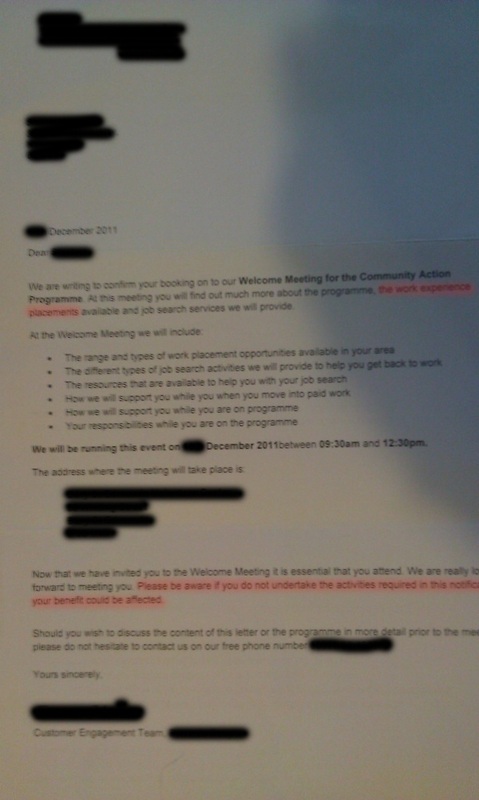 It was bad enough that the Job Centre were telling people to do unpaid work placements, it is much worse that placements are being advertised alongside real jobs. 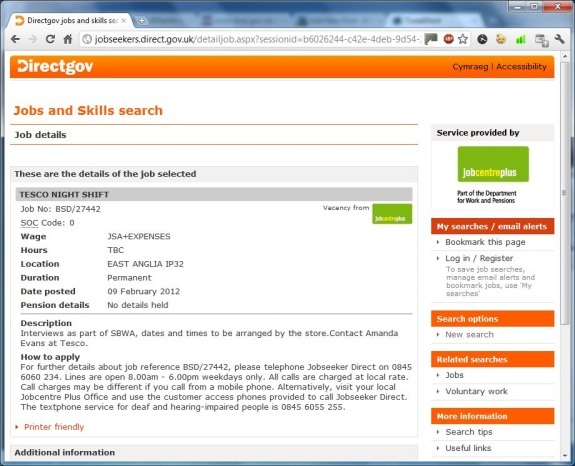 The government use the number of jobs advertised by the job centre to gauge the number of jobs available altogether. Do they exclude these unpaid placements from their statistics? Government statistics have revealed that in all, 24,010 people have been forced to take part in “Mandatory Work Activity” – four weeks at 30 hours per week – between May and November 2011. This whole thing is the modern-day equivalent of indebted servitude. Peonage. BBC Newsnight covered this story. 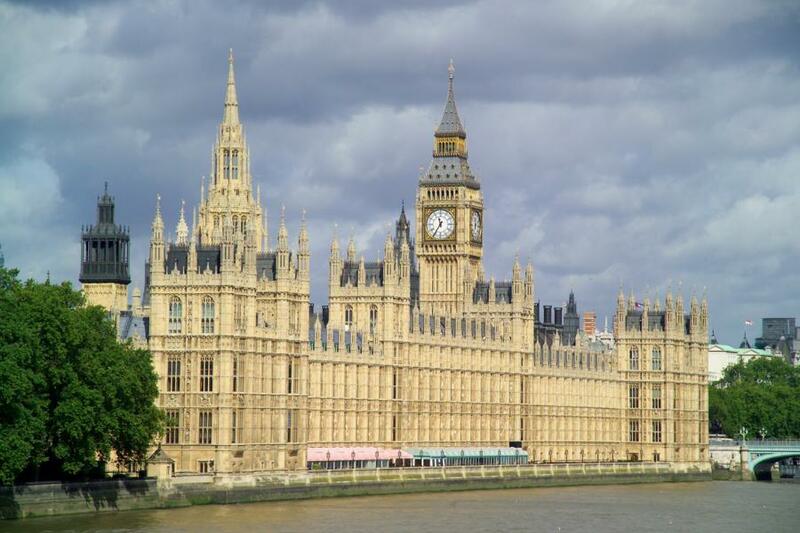 Please sign the petition to abolish work for benefit schemes. I have written more about work programmes in a previous blog post. Who benefits from The Work Programme? The problem is that The Work Programme (a name which sounds really ominous to me) hasn’t actually helped all that many people. It turns out that only 1 in 5 people on the programme have managed to get a permanent job out of it, and BBC research indicates that it could be even lower. Even the DWP only estimated that 2 in 5 would do so. Given that the Future Jobs Fund was achieving a 54% success rate at getting people into work and The Work Programme was only ever expected to achieve 40% it seems like it was replaced purely out of ideology or “not invented here” syndrome. 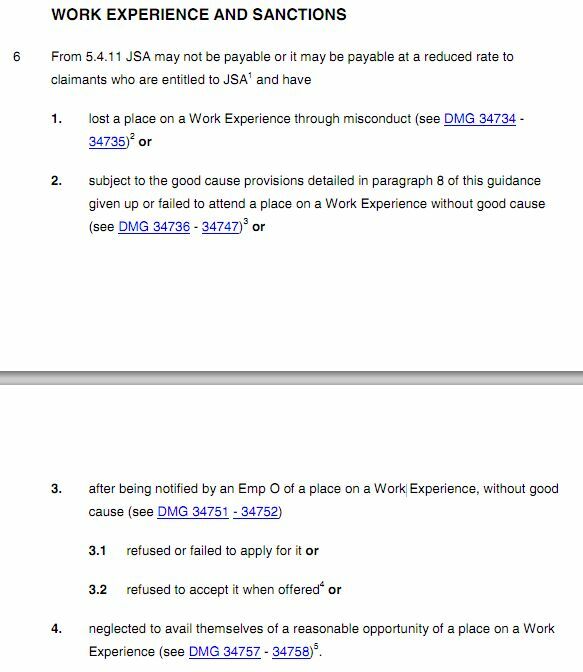 The low success rate of The Work Programme has not been helped by hiring A4e as one of the contractors to implement the scheme. Their previous efforts in the Pathways to Work Programme achieved 9% of people into work out of an expected 30%. The DWP ignored this record when considering contractors because some other contractors had no previous record to judge. The Work Programme doesn’t seem to be all bad. This video made by The Guardian about a provider called Cheshire Training shows some positive aspects of the programme such as providing job application sessions, CV workshops, advice and some structure to keep people from giving up or being worn down by the lack of activity that is often involved in unemployment. I think such services could easily have been provided by the Job Centre rather than being outsourced, and in fact, some were or are. While there are some positive aspects highlighted in the above video there are some rather larger down sides to the programme – forced labour being the biggest problem. There are two schemes that take place before the work programme itself: The Work Experience Scheme and Mandatory Work Activity Scheme. They involve being sent to work – usually full time – in a business that is paid to provide work experience. The placement usually lasts between two and eight weeks. Taking part in the scheme is not optional. 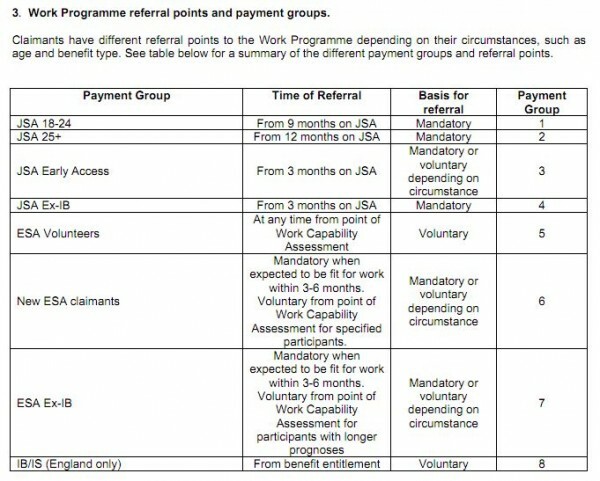 If an adviser at the Job Centre Plus or in a provider of the work programme has decided that you must do some work experience, then you will have your benefits cut for at least 13 weeks and potentially 26 weeks if you do not. 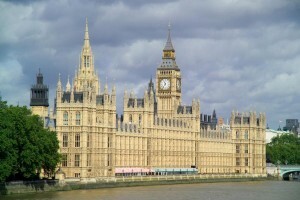 (And up to three years under the Welfare Reform Bill.) This is made worse by the fact that the job seeker does not get to choose their placement, they will be sent wherever the private contractor wants to send them. Not only that, but the work placements for the most part involve no training, only basic unskilled labour such as stacking shelves and washing floors. The Work Programme itself involves placements that can last up to six months and job seekers can be assigned to the programme for two years. People sent on these placements are often doing the same jobs as people paid a full time minimum wage, except that is becoming rarer because many businesses that take part in the scheme have laid of temporary and part time staff in favour of free labour from the scheme. Instead of paying their staff, these big businesses are getting paid to put people to work. This might perhaps be just about acceptable if the people on the schemes were given a job at the end of the placement, but the norm is for them to be sent back to the job centre and a new unemployed person put to work in an endless cycle of free labour. It is baffling why our government thinks that paying businesses money to exploit people and making people work a full time job to the benefit of private industry for just their £53 per week job seekers allowance is a good idea. Even if the DWP do require people to work in return for their benefits (And I don’t think that fits the ideal of ensuring that no one is destitute) I do not think they should be required to work for more hours than they receive the equivalent money for at minimum wage. Indeed, it may well be illegal for these people not to be paid minimum wage and I hope that there are some successful legal cases against the scheme soon. Cait Reilly is a good example of how the work experience scheme is at best unhelpful. She willingly attended an open day for people looking for retail work, work that she was quite prepared to take. However, after attending that open day she was then forced into a work experience placement at Poundland. The following is a quote from a comment left under the video shown earlier in this article. “I personally know a fifty-six year old man who worked at Tesco for 40 hrs a week for 6 weeks for no pay. He said he was given the worst job, constantly filling freezers in the hope he would be taken on. After the 6 weeks were up the manager asked him if he would like to stay on for some extra weeks, my friend asked “with pay”? The manager said why would he pay him when he can pick the phone up and get more unemployed people who have to work for nothing of face sanctions meaning loss of ALL benefits for up to three years! The above scenario of businesses taking on free labour for busy periods is not uncommon. We also have this example of a woman who worked for six months at Newham Council alongside colleagues who though that she was a permanent paid employee. I went to [her] leaving do … We were all so sorry to see her go. She was an older lady and was one of the most hard-working and genuinely helpful admin staff we’d ever had. Worked her hours plus more and nothing was ever too much trouble for her. We honestly didn’t know why she was leaving after only six months. She’d worked a minimum of 37 hours per week (often more) and been the backbone of service delivery. The basic starting wage for that level is around £17,000 but for the work she was doing I would have expected her to be started at a few thousand more. Yet all she was getting was JSA and the fares for her lengthy bus journeys, while people doing identical work were getting a salary, paid leave and pension contributions. We were horrified. Perhaps government ministers don’t understand why unpaid labour is a problem because they are in the habit of finding unpaid internships and eventually real jobs for their own children through their family and business connections. Many even pay the employers to take on interns – £200 per day isn’t unknown. This is all very well for the rich, but most people who receive Job Seekers Allowance can barely afford food and rent. For those who are rich enough, paying for an internship at a bank at least provides useful experience for future employment in that industry, while being sent to stack shelves at Tesco or wash floors at Poundland for months at a time does not provide much for a CV in my opinion. It seems unlikely that a useful reference would come from such a placement, if the manager could even remember one person among such a high turnover. Volunteering for a charity is a positive thing that will tell an employer something about the job applicant. Being forced to wash floors for three months doesn’t say much about them at all. It seems that opinion is turning against this exploitation. Waterstones recently pulled out of the work experience scheme and some other companies that were accused of taking part, like Sainsbury’s, denied it quite strenuously and were keen to distance themselves. (Despite their denials Sainsbury’s are still involved in the scheme.) Cait Reilly who was mentioned above is persuing a legal case against the government. There is also a growing call for interns to be paid minimum wage. I don’t object to work experience. It is quite reasonable for an unemployed person to spend one or two weeks in a relevant job learning useful skills for future employment. The Work Programme does not provide this. Instead it sends free labour to profitable businesses, and pays them for the privilege. These people do not receive useful training but simply replace paid staff in doing hard repetitive work. Most of the businesses taking part are profitable, in fact Tesco made a profit of £14,000 per employee last year. If they have work to be done then they should pay people to do that work. It’s that simple. People being sent for work experience should not be replacing staff, they should be shadowing them, assisting them and learning. What is even more scary is that the government are systematically destroying workers’ rights making people more likely to become unemployed. Examples such as this call to Give firms freedom to sack unproductive workers soon add up to a worrying lack of job security. 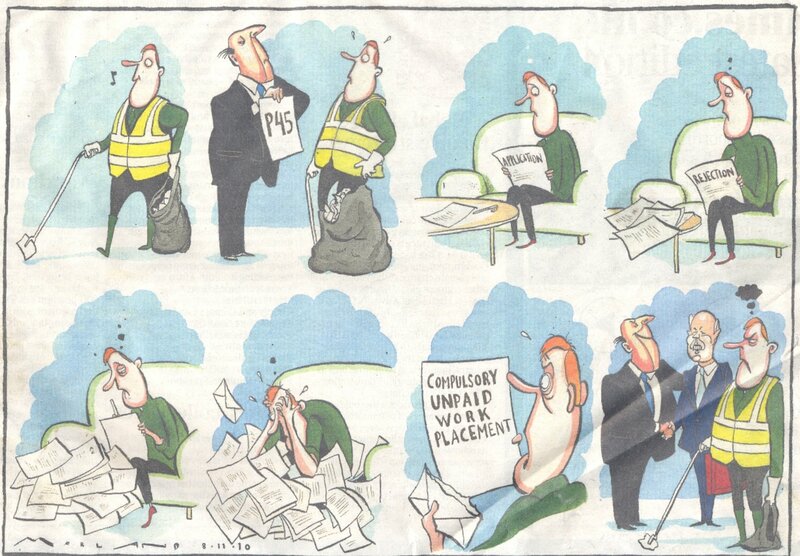 Is it really the Tory plan to have so many people sacked and working for free? 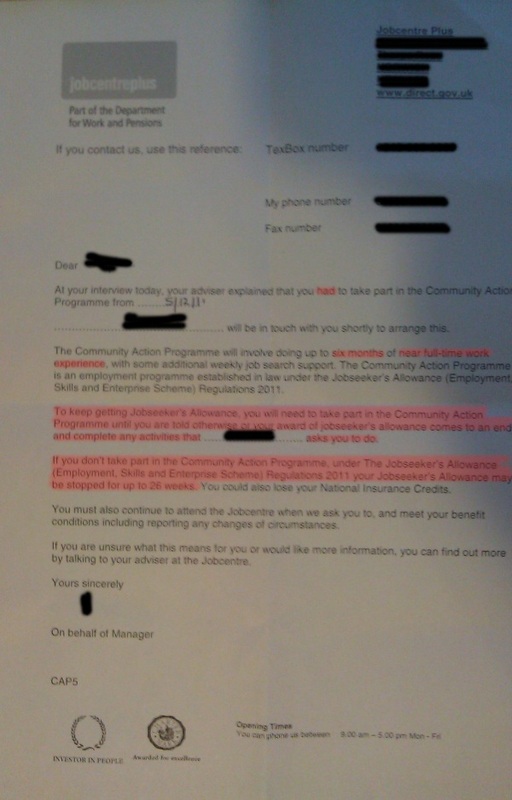 Author LatentexistencePosted on 9th February 2012 16th February 2012 Categories PoliticsTags benefits, forced labour, job seekers allowance, jsa, work experience, work placement, workfare4 Comments on Who benefits from The Work Programme? 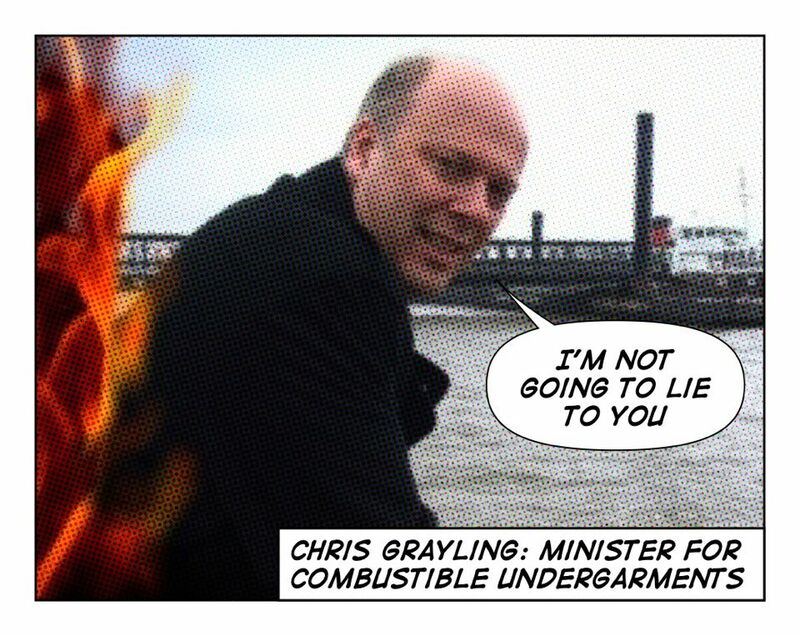 Author LatentexistencePosted on 11th March 2011 11th March 2011 Categories PoliticsTags benefits, jsa, scroungers, unemployment, welfare state, work21 Comments on People on benefits? They’re all scroungers aren’t they?